This week my sewing space looks like this. Rather messy. But good messy, in my opinion. Lots in the making. Nothing finished - yet. 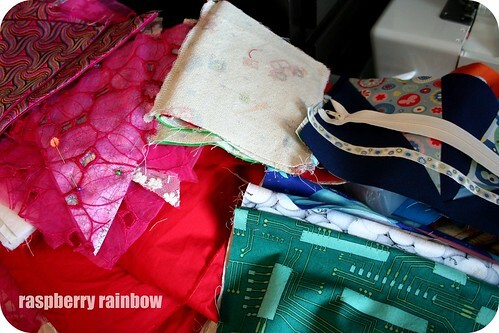 I am in the middle of making some pink sparkly bunting, two rattle cubes and another assortment of zippered pouches. Many of these will be Christmas presents. Pop in and visit some other Creative Spaces over here. Oh it is a lovely mess for sure. You're so organised to be already in the making for Christmas. Good on you. Ahh, a messy creative space is certainly a happy space! I don't think there is ever a bad mess when being creative. Happy sewing! I looked at the makings of sometnig good and thought what is the pink ?? Bunting looks like special bunting for sure. My whole house is a creative mess most of the time with bits and pieces of crafting stuff from finished and unfinished projects all over the place! Just checked out your rattle cubes - another thing that I've been wanting to make for a while! BTW, I'm super impresssed with your Christmas pressie making already! go you! I don't think my sewing space is ever tidy. I live in hope.